Abu Dhabi: It was here at the Etihad Airways Formula One Abu Dhabi Grand Prix where Nico Rosberg claimed his first Formula One World title last year with a dramatic second-place finish. Race winner and teammate Lewis Hamilton didn’t make it easy for the German. The Briton, twice ignored team instructions to pick up the pace, firstly from his race engineer and then from Mercedes technical chief Paddy Lowe, as he backed up the field to try to hold up Rosberg and put him within reach of Sebastian Vettel of Ferrari. The rivalry within the teammates was well documented all through that season. After clinching his maiden Drivers’ Championship, Rosberg brought down the curtain on those epic battles — rather abruptly to say the least. The pair were embroiled in a fight for the title in three straight seasons between 2014 and 2016, with Hamilton coming out on top for the first two years, while Rosberg winning the last. One year down the line and Hamilton has gone on to seal another title and Rosberg is living a peaceful life but not away from the fast lane. And though not behind the wheels, Rosberg and Hamilton keep crossing paths as the former has now taken up a role as a television analyst — a perfect channel to keep the rivalry alive. Ahead of the final race qualifying, a leading British broadcast had already started floating in news tickers to stay tuned for a documentary where Rosberg was giving tips to rivals on how to beat the Mercedes star. With such antics still floating around, it is certainly clear the normal relationship between the two is far from near. 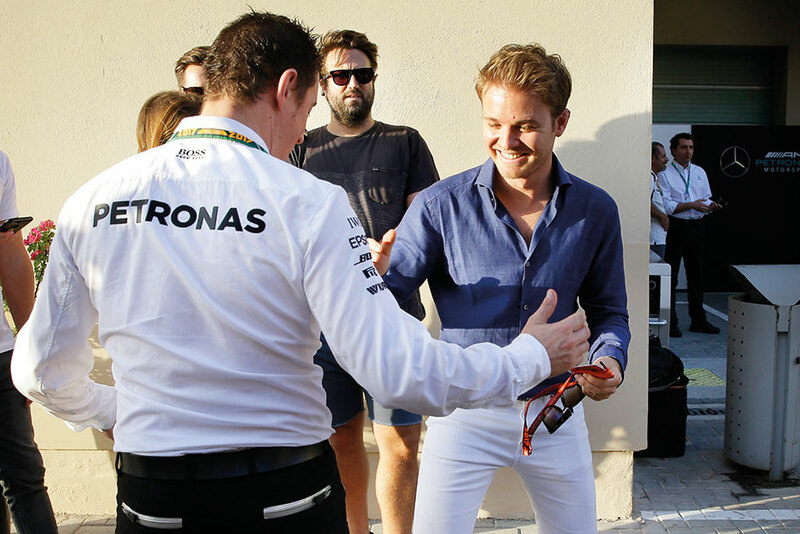 Rosberg, wearing a navy blue shirt, white pants and black shades made a starry appearance into the paddock, came and stood right in front of the Mercedes garage. “It is good to be here and very emotional moment. As I was walking in, all the memories came back you see,” said 32-year-old in an exclusive interview with Gulf News. “It was like a flashback, crossing the finish line and winning the championship. All those memories simply flowed down from head to toe. This place will remain special for me for life,” added Rosberg, who was in the Mercedes garage a little before Hamilton entered for his final preparations. Rosberg, who signed off from the sport with a championship, 24 wins and 57 podium finishes, then made a dash for the VIP enclosures to get a clear view of the action from the top. “Entering the team garage was a different feeling. What I did on that night last year all came to mind. Everyone trying to get things sorted for you and stuff. Nothing looked different other than, you are not there — strange feeling. Then to see all the cars zip off from the top from where you started once was indeed special,” said Rosberg, who was behind the mic with three-time Formula 1 champion and Mercedes F1 team chairman Niki Lauda to do the commentary on the day’s action. That’s not all, Rosberg has joined force with Robert Kubica’s management team to help progress the Polish driver return to racing in Formula 1 in 2018. Kubica’s F1 career stalled after he suffered life-threatening injuries in a rally crash in 2011, but he has been pushing to return to the grid next season and twice tested with Renault. He is scheduled to test for Williams, who will be missing the services of veteran Felipe Massa, following the last race in the capital.